Time to wrap up warm, drink steaming hot drinks and find unique gifts for your loved ones. And where better to stock up on festive cheer than one of the hundreds of amazing Christmas markets taking place across the country over the festive period? We’ve finally caught up with the continent at capturing the spirit of Christmas at these lovely festive markets, so take a look at our top 10 places to visit in the UK for a bit of seasonal cheer. Belfast’s Christmas market will host a range of local food and drink producers this year with 20 additional stalls to celebrate the climax of Northern Ireland’s Year of Food and Drink. As always, the market will be located in the centre in the City Hall grounds. Those with a sweet tooth can take a trip down the aptly titled Candy Alley, and children can visit Santa at his grotto. The market also operates a buddy scheme which gives those with reduced mobility easier access to the stalls during quiet periods. THE DEAL: Two nights at the Holiday Inn Belfast costs from £67.50pp, on a room-only rate. Based on December 4 arrival. Every year, the city centre is transformed into the largest Christmas market outside of Germanyand Austria – and this year it’s celebrating its 50th birthday. The venture was born in 1966 as part of an agreement between Birmingham and Frankfurt, and the two cities have been collaborating on projects ever since. Here you’ll find a range of unique gifts, from hand-crafted toys and jewellery to bespoke decorations for your tree. There’s also a range of traditional food and drink – tuck into a bratwurst or a pretzel, or indulge in a hot chocolate. The deal: Two nights at the Royal Angus Hotel in Birmingham costs from £86pp on half-board. Based on November 27 arrival. Easily the most famous north of the border, this year it returns to its traditional pitch at East Princes Street Gardens, close to the winter ice rink. It’s one of the country’s longest-running markets and the Scottish section has traditional crafts and gifts, while the European part has a more multicultural feel. Nearby Santa Land also has a children’s market. If the weather proves too much, you can warm up in the carousel bar with a mulled wine or a hot chocolate. The deal: Two nights at the Hilton Edinburgh Carlton costs from £127pp, room-only, between November 19 and December 23. Plenty of choice in the capital – the German Southbank Centre Winter Market near Waterloo has a range of chalets selling hand-crafted gifts as well as rides and attractions to keep children amused. New for this year is another German market at Leicester Square, with a packed entertainment programme with circus performers and dancers. There is also a Santa’s Grotto for children (both open November 11-January 8). Winter Wonderland in Hyde Park is huge, with German, Angels and Fairies markets. with circus performers and dancers. There is also a Santa’s Grotto for children (both open November 11-January 8). Winter Wonderland in Hyde Park is huge, with German, Angels and Fairies markets. The historic city of Bath’s festive market has 170 wooden chalets in the streets surrounding the Abbey. Its central location makes it easily accessible and almost all of the stallholders come from Bath and the surrounding area – and most of their products are handmade. Exhibitors include a beekeeper selling honey and beeswax skincare products, a Somerset vineyard selling award-winning English wine and a craft company which sells a range of handmade glass. The deal: Two nights at the Hilton Bath City costs from £125pp, room-only. Based on arrival between November 24 and December 11. 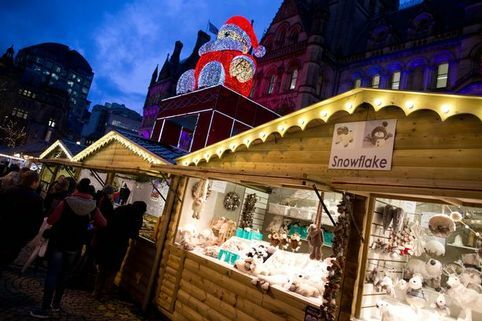 Manchester has one of the most sprawling Christmas markets in the UK with around 300 exhibitors occupying its wooden chalets each year. The award-winning event doesn’t just restrict itself to German produce – it also sells other European goods, such as French soaps and Belgian kitchenware. Its cosmopolitan feel extends to its numerous food stalls, where everything from goulash to paella is on offer. If you’re looking for something traditionally British, you can also tuck into a hog roast. The deal: Two nights at the Macdonald Hotel in Manchester costs from £139pp and includes breakfast, mulled wine and mince pies. Based on arrival between November 11 and December 20. The St Nicholas Fair returns to the city this year, with the glorious backdrop of York Minster. The chalets will have a range of gifts and food, including traditional Yorkshire produce for Christmas dinners. It also stocks various local wines and cheeses. The deal: Two nights at The Grange Hotel in York costs from £210.50pp. Includes a three-course dinner and breakfast plus a bottle of champagne and gourmet chocolates. Based on arrival between November 17 and December 23. Cardiff has one of the fastest-growing festive markets in the country, run by Craft*folK, a body established to support artists in the area. Established in 1994, it was expanded last year to occupy an even greater area of the city centre. Last year almost 200 businesses from across Wales – from candlemakers to ceramic crafters and brewers to jewellers – exhibited. Many are expected to return this year, with plenty of new ones joining them. The deal: Two nights at The Holiday Inn in Cardiff city centre costs from £83.50pp, room-only. Arrive November 30. Right in the heart of the historic city, next to the cathedral. It has 70 wooden chalets selling a range of goods. The event attracts exhibitors from across the Wirral and North Wales and last year stalls included a microbrewery, a fudge maker, a cheese maker and a hat maker. Open seven days a week, with late-night shopping on Thursdays and Fridays. The deal: Two nights’ B&B at the Chester The Queen hotel costs from £133.20pp with Hallmark Hotels, with dinner on one evening. Arrive November 26. The Leeds Christkindelmarkt has become one of the best known in the UK. In the heart of the city at Millennium Square, this year it will feature a stage as its centrepiece with musical entertainment throughout the day. There will also be a children’s show every Sunday. Also new for this year is an apres-ski bar. The Bavarian restaurant, with its real log fire, returns too, although booking is recommended. The deal: Two nights at the Premier Inn Leeds City Centre from £42.50pp room-only. Based on December 4 arrival. Room rates are correct at time of publication.